Description of "Rediscover your life NLP (eBook)"
This book has explained the NLP principles and techniques in a very simple language. It also touches upon the practical applications of NLP with relevant examples and will benefit the readers by giving them a clear method on how to apply the various techniques of NLP. The author is a trained and certified NLP practitioner and coach. He is also a corporate soft skills trainer. The thought of simplifying NLP techniques and related practices, so that they will benefit the readers, was the main idea of writing this book. 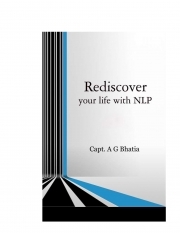 Reviews of "Rediscover your life NLP (eBook)"
This book is very helpful in understanding the concepts of NLP. The principles of NLP have been explained in very simple language and illustrations are also given to show the practical application. Overall a very good book for NLP.